How do I add a table to my Website Builder site? Open Website Builder from the One.com control panel. From the menu on the left, drag the Table component into your workspace. Use the buttons in the top/bottom menu to add and remove rows and columns according to your needs. Type your content in the cells. 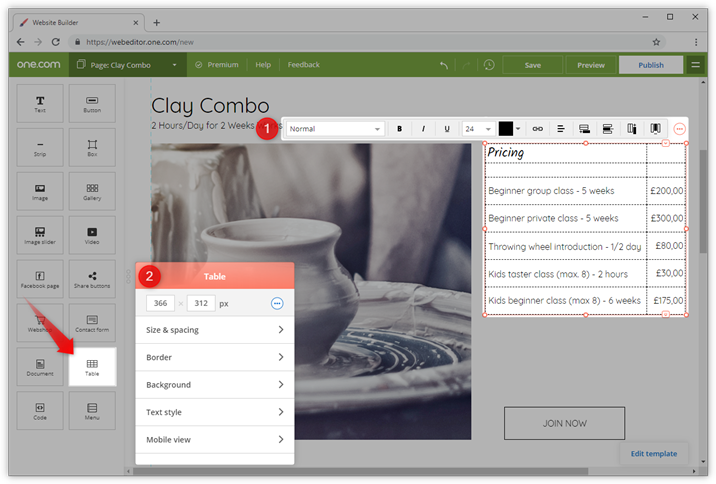 Click Edit table to adjust the properties of the table, like fonts, borders and background. Click Save and Publish to make the table visible on your site. Tip: Make the borders invisible by selecting "no borders" under properties, to create a clean and ordered look. You can adjust the table on your website from the menu that appears above or below the table and in the floating menu that you can move around on your workspace. Drop-down menu - Select predefined formatting for the text in your table. Text formatting - Make text bold, italic or underlined, adjust the size and adjust colour. Link - Make text in the table into a link. Click the chain icon and set the location you want to link to. If you select a cell, only the text in that cell will be affected, if you select nothing all text in the table will be affected. Orientation - Align text left, center or right or justify. Add and remove rows and columns - Use these buttons to add more rows and columns, or remove them. Replace image - Click this button to select another image. Size and spacing - Set the cell width, it changes automatically for the whole column, changing cell height affects the whole row. Spacing determines how much space there is to each side of the cell. Border - Here you can set the style for the border, dashed, dotted and lined, or remove it completely so no border is visible. You can also set the colour, opacity and width. Background - Add a colour or image as a background. If you select a cell, it will only be added to that cell, if you select nothing it will be added to all cells of your table. Text style - Edit the text styles of your table, you can change font, size, colour, orientation and placement in the cell. You can also highlight text and add shadow. If you select a cell, only that cell will be affected, if you select nothing all cells of the table are affected. Mobile view - Here you can hide the table in mobile view, or, if the table is part of your template, move it to the bottom of the page. How do add an image to my Website Builder site?